Why should we save tigers? At the turn of the 20th century, it is estimated that India probably had many thousands of tigers in the wild. The Wildlife Institute of India (WII) and the National Tiger Conservation Authority (NTCA), Government of India, have been conducting tiger estimation surveys in partnership with NGOs. WWF-India was the key NGO partner of the WII and NTCA in conducting the comprehensive country-wide tiger estimation exercise in 2010-11, which revealed a mean tiger population estimate of 1,706. Based on a census using the pug mark technique, the number of tigers in 2002 stood at 3,642. As per the 2008 tiger estimation exercise conducted by WII in association with the NTCA using camera traps, there were only 1,411 tigers left in the wild in India. The tiger is not just a charismatic species or just another wild animal living in some far away forest. The tiger is a unique animal which plays a pivotal role in the health and diversity of an ecosystem. It is a top predator which is at the apex of the food chain and keeps the population of wild ungulates in check, thereby maintaining the balance between prey herbivores and the vegetation upon which they feed. 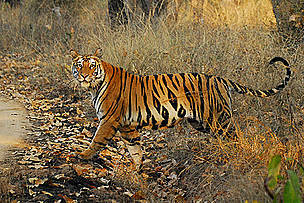 Therefore, the presence of tigers in the forest is an indicator of the well being of the ecosystem. The extinction of this top predator is an indication that its ecosystem is not sufficiently protected, and neither would it exist for long thereafter. If the tigers go extinct, the entire system would collapse. For e.g. when the Dodos went extinct in Mauritius, one species of Acacia tree stopped regenerating completely. So when a species goes extinct, it leaves behind a scar, which affects the entire ecosystem. Another reason why we need to save the tiger is that our forests are water catchment areas. Therefore, it’s not just about saving a beautiful animal. It is about making sure that we live a little longer as the forests are known to provide ecological services like clean air, water, pollination, temperature regulation etc. The tiger is a unique animal which plays a pivotal role in the health and diversity of an ecosystem. How you can save the tigers?